Betty Don’t just featured on John Kerr’s Country Show on BBC Radio Ulster, check it out on the iPlayer below. Summer tour including solo acoustic and full band shows, with a few festival dates. Betty Don’t – New Single! 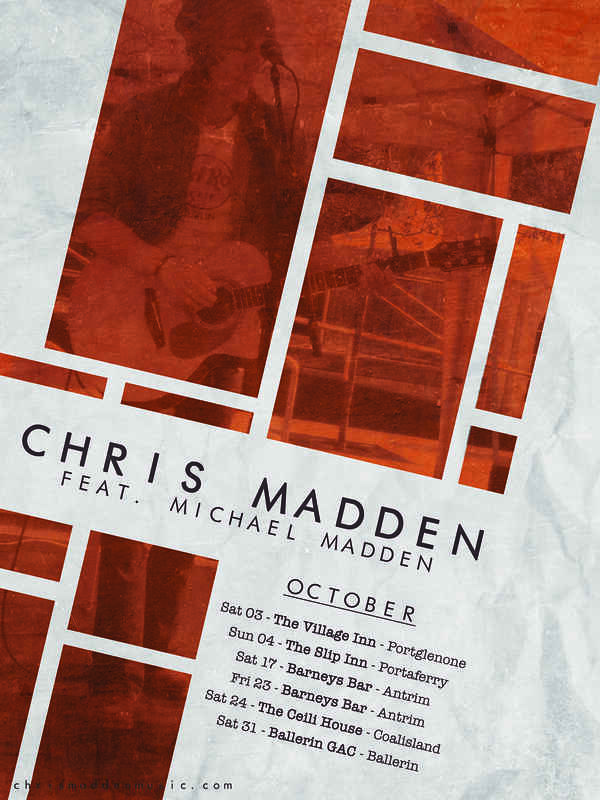 Chris Madden & The Lucky Ducks – Spring / Summer Tour. 26 Date Irish tour throughout March, April May June & July, feat. Connor Kearney & Aine Harkin on select full band shows. Massive thanks to everyone who came out to see me & the band on The Just Drive Tour, we had some really great nights, hope to see y’all soon! In the meantime check out this playlist off originals & covers from the tour. Chris Madden Band’s Just Drive Tour. 8 Date Irish tour throughout February & March feat. Connor Kearney & Aine Harkin on select full band shows. On Saturday the 1st of December we will embark on a 6 date Northern Irish Tour, featuring Connor Kearney & Aine Harkin on select dates. On Saturday 23rd of September we will embark on a 12 date Northern Irish Tour, featuring Connor Kearney & Aine Harkin on select dates. On Saturday the 3rd of June we will embark on a 23 date Irish Tour, featuring Connor Kearney, Michael Madden & Aine Harkin on select dates. My new single Worlds Gone To $h!t is out now! Get it on iTunes for 79p! Also available on Google Play & Amazon. Worlds Gone To $h!t – New Single & Music Video, Out Tomorrow! Available on Amazon, Googleplay & iTunes. Video on Youtube. Chris will embark on a 22 Date Irish Spring Tour Supporting the new single “Worlds Gone $h!t” starting on March 3rd in Frank Eddie’s Co. Cavan & ending on May 21st in The Slip In Co. Down. Connor Kearney & Aine Harkin will feature on select dates. Check out Chris’s live cover of Ram Jam’s Black Betty, live from Madden Studio’s. Extra date added to the Extended Winter Tour. 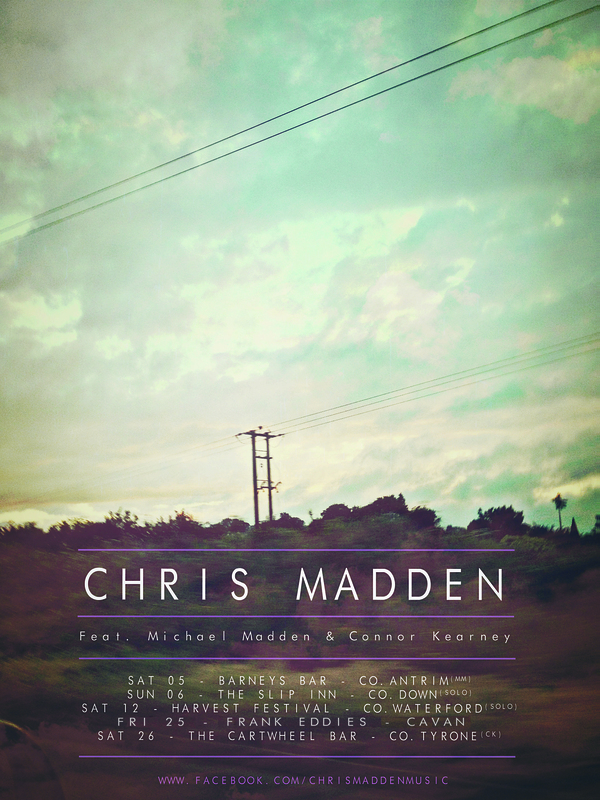 Chris will play a solo acoustic Showcase at Pat’s Bar, Portglenone on Sunday 19th of February. My song “Crazy Bars & Fast Cars” from my debut EP of the same name will feature in a BBC Documentary “Love In A Day”. It will be broadcast on BBCNI on Monday the 6th of February at 22:40. Thanks to the BBC & everyone involved for including my song, it means a lot! “Just Drive” a song I wrote with Rolling Stone reviewed artist David Lyttle is featured on the Nerve Centre‘s album Scenarios, & it’s now out on 12 inch vinyl! Available to purchase at Cool Discs Derry & Abbazappa Record Store Derry. Chris will be embarking on a 10 date Northern Irish extended winter tour, kicking off on Saturday 14th of January in The Three Oaks & ending on Saturday 18th of February in The Scenic Inn. The tour will Feat. Connor Kearney on lead guitar on select dates. Connor Kearney will accompany me on lead guitar duties for the remainder of the On The Road Again Irish tour, from the 3rd of September to the 31st of December. Connor played 25 dates of the Crazy Bars & Fast Cars tour last year & a few select dates this year as well, so he is no stranger to the setup, we look forward to having him on board. Chris Madden will be playing Stendhal Festival on Friday 12th August, alongside artists such as Badly Drawn Boy, Therapy, Hayseed Dixie & more. New Music on The Nerve Centre’s Scenarios Album! Just Drive, a new song I co-wrote with David Lyttle is featured on the Nerve Centre‘s album Scenarios, it’s an album of emerging and established artists from Northern Ireland, Feat. VerseChorusVerse, Jessica Doherty, Rosborough & many more, be sure & check it out! The album is set for release in early June. Links Below. Crazy Bars & Fast Cars EP Now on Spotify! Here is a Live cover of Chuck Berry’s Run Rudolph to get you into the christmas spirit, feat Michael Madden on lead guitar & vocals. Michael will be playing all dates with me over the christmas period, so be sure & catch a show! Happy Independence Day! To celebrate here’s a cover of Martina McBride’s Independence Day.